Amazing Race 22, "I Love Monkeys!" 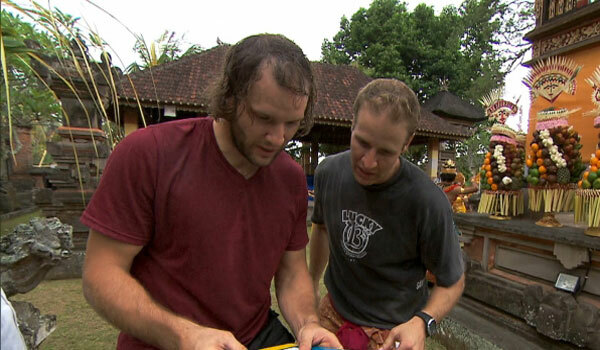 Only four episodes have passed, but this is shaping up to be one of the strangest installments in Amazing Race history. The season began with three teams quitting a Roadblock and was followed by a pair giving up due to a fear of water. David and Connor still win the two-part leg despite the fact that David has a ruptured Achilles. All of these are crazy examples, but they pale in comparison to the baffling conclusion this week. John and Jessica have clearly been one of the strongest teams in this competition. He seems bored by just avoiding elimination and has been focusing on alliances and other strategy. They earned the Express Pass in the opening week, but it ends up being the crutch that spells their downfall. The key with this reward is not waiting for the perfect time to play it. If there’s any doubt that elimination may happen, why take the chance? Believing the roller derby moms are behind them, John and Jessica stumble through the Detour and fall short at a deceptive Roadblock. He seems like the real culprit and repeatedly insists they’re in good shape, even after elimination. Phil’s “oy vey” comment before the end credits shows the peculiar nature of this surprise exit. The editors gleefully telegraph John’s fall by repeatedly showing his arrogance. It’s hard to blame them, though. He makes it really easy by speaking frequently about his amazing skills. When talking about his attention to detail, John clearly explains that she isn’t so good, but he is awesome. Meghan and Joey are set up as an obvious counterpoint to them; the YouTube hosts look surprised every time they do well. Beyond the obvious enjoyment at watching an arrogant guy fall, the result shows the limited impact of making an alliance on the race. It may get them a better flight, but it means little in the final scramble to reach the mat. It also shows the dangers of thinking too hard about strategy. Even after their problems at the Detour, John and Jessica can still move on if they use the Express Pass at the Roadblock. Instead, he insists they’re fine despite all the evidence to the contrary. If there’s any doubt about their placement, a team should always expect the worst. Last week ended with a cliffhanger of whether David would continue to race on crutches. When he immediately dismisses the idea this week, it’s clear this was a cheat by the editors. Shame on you, Amazing Race producers! Experienced viewers didn’t fall for this ploy. The clue from Phil sends teams to Bali to continue this honeymoon version of the race. Will they ever visit a crowded metropolitan area? The front group finds a flight that lands almost four hours ahead of the others. Max and Katie are the big winners by calling ahead to a travel agency and leap back to the front. They have a strong week and appear to be a top contender. John and Jessica also find a better flight with Joey and Meghan to get within two hours. Teams are raring to go, but their fate rests in the hands of a monkey. Their chosen ally must eat through a coconut to reveal their next clue. It’s a clever move, particularly when the monkey decides to make a run for it. The Detour choices are “Fruity Top” or “Sandy Bottom”, and nearly everyone chooses the first option. It involves constructing a large religious offering of fruits called a gebogan. It takes a while, but only John and Jessica have serious problems. They eventually choose the other Detour while everyone in America yells “Use the Express Pass!” at their screens. “Sandy Bottom” looks harder from a physical standpoint but actually doesn’t seem too challenging. Mona and Beth show their mettle and gain some ground on the trailing group. The final task of this grueling double leg is a Roadblock at Uluwatu Beach. It’s a rare case where it tests knowledge of previous legs before the finale. Players navigate a large group of surfboards to locate something they’ve encountered in a previous leg. The brilliance of this task is requiring them to locate Phil to discover if their answer is correct. He isn’t easy to find and is a long way away, so taking random guesses is not a wise move. Another less sportsmanlike option is just stealing a glance at another team’s board; this move helps Connor to edge Winnie and grab a first-place finish. Caroline tries the random approach and picks general answers, and the failures push her to the edge. They still finish in fourth, but it’s clear they might not be ready to make a serious run. It comes down to Chuck versus John for the last spot, and the tenacious Alabama guy stays alive. Watching him crawl through small rock openings and run all over the beach makes it exciting to see him continue. That guy is great television. Eight teams still remain in this race, yet it’s very difficult to see much differentiation among the teams. The hockey players seemed like one of the stronger pairs, but they stumble into seventh this time. Pam and Winnie nearly took a water craft right out of the competition a few weeks ago, yet they could be true contenders. This unpredictability could deliver a strong finish for a head-scratching season. When teams eventually leave the attractive islands of the Pacific, they’ll likely have to show more determination to survive. Regardless, there are sure to be more surprises in the coming weeks. Ruth, you should be able to find the episode on CBS.com. They put all the full episodes on the site's Amazing Race section right after they air. There was a new one last night, but it shouldn't be too hard to find this episode. That's great that you had the opportunity to visit Bali as a kid. Given what I've seen of it, I'd love to go there!